To “Welcome the Warmth” we will be hosting what we hope will be your first BBQ for 2018 on Sunday April 29th at the residence of board members Francois& Margaret Detraz in Vallorbe. The event begins at 1:00pm. Let us know what you will carry!! 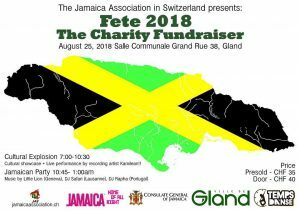 Today we launch our upcoming fundraising fete!!! The proceeds will help to build bathrooms at the Hodges Land Basic School for children in St Elizabeth, Jamaica!